Bank Giro Loterij says: "we will give you directives on how you will make the transfer of your initial deposit to us"
Hello, I am Miss Young. This time I have won 850,000 EURO in a dutch lottery. Read all about it. Go to the homepage to see more stories. We are pleased to inform you of the announcement today 6th of March 2005, of winners of the BANK GIRO LOTERIJ INTERNATIONAL PROMOTION PROGRAMS held on 27 DECEMBER ,2004. Your email address attached to ticket number 023-56678230954, drew the lucky numbers 7-14-21-42-49-59, batch number GL/91663/A and consequently won the lottery in the 1st category. You have therefore been approved of a lump sum pay out of EURO 850.000.00 (Eight Hundred and Fifty Thousand Euro) in credited to file LOTTERY REF NO.IPL/4249859609/WL1 This is from total prize money of Euro 20,000,000.00 shared among the seventeen international winners in categories C with serial number: IL/FLW/12-C033721192.All participants were selected through a computer ballot system drawn form 25,000 company email addresses and 30,000,000 individual email addresses from Australia, Africa, New Zealand, America, Europe, North America and Asia as part of International Promotions Program, which is conducted annually. CONGRATULATIONS! Your fund is now in custody of a financial Security company insured in your FILE REFERENCE. Due to the mix up of some numbers and names, we ask that you keep this award strictly from public notice until your claim has been processed and your money remitted to your account. This is part of our security protocol to avoid double claiming or unscrupulous acts by participants of this program. This lottery program was promoted by our group of philanthropist here in Netherlands. We hope with a part of you prize, you Will participate in our end of year high stakes EURO 5,000,000 million International Lottery. 2. quote your reference/batch numbers in any correspondences with us or our designated agent. Furthermore, should there be any change of your address, do inform your claims agent as soon as possible. Congratulations once again from our team of staff and thank you for being part of our promotional Program. I write to Thomas Brown to claim my price. We have confirmed and approved the above winning, Following the Result of our verification exercise. Your batch number GL/91663/A and Reference numbers: IPL/4249859609/WP1.You have won the sum of 850.000.00 Euro (Eight Hundred of fifty Thounsand Euro).Among the ten international winners in the second categories with your security file number is DL/99621/A11 promoted by our group of Philanthropist here in Netherlands. Bankgiro Lottery Promotion will issue an Irrevocable Guarantee of Payment Bond (IGPB) in your favor,thereby securing the above prize money. A copy of the IGPB will be forwarded to our paying bank for immediate action. However,(Bankgiro Lottery Promotion) has been notified of this development and the status of your claim. I am sending you attached copy of payment processing Form, you are required to print and fill it correctly, and fax or Send through email back to us. When this form is completed and returned, we shall start processing your application immediately. We are waiting your immediate response for further Details with the modalities to receive your winning prize into your designated Bank Account. I fill in the form and return it. We are in receipt of your completed Claim form. Having done all the proper verification exercise from all our department, we found you worthy of the cash prize in our lottery program organized by Bankgiro lottery International Promotion. Meanwhile as for now everything seem to be working in your favour, all that we require from you now, is your maximum cooperation for smooth transfer of your money through our paying bank to you. Now, you will be require to make a choice of the type of account that will be comfortable with you, based on the number of times you wish to receive your winning in your account, below are the account options available in our paying bank. 1. Regular Account, the initial deposit is �1,500.00 (One thousand, five hundred Euros). The Maximum transfer possible within a month is $500,000.00 (Five Hundred Thousand USD). 2. Daily Account, the initial deposit is �2,500.00 (Two thousand, five hundred Euros). The Maximum transfer possible within a month is $1,000,000.00 (One Million USD). 3. Premium Account, the initial deposit is �3,500 (Three thousand, five hundred Euros). The transfer possible within a month from this account is $1,500,000.00 (One Million Five Hundred Thousand USD). 4. Platinum Account, the initial deposit is �4,500.00 (Four thousand, five hundred Euros), the maximum transfer possible from this account within a month is 10,000,000.00 (Ten Million USD). You will be required to activate the account of your choice with our paying bank with the initial deposit for account activation to be paid by you. 1. Your winning is presently in a suspense account and we cannot make any deduction of any kind until it is deposited in your name in an active account which will make it suitable for transfer. 2. Your Initial deposit paid by you will be added to your winning and an Account Number and a Pin Code will be giving to you to confirm and transfer your funds. Please confirm to us the type of account you wish to activate so that we can notarize your winning with the Netherlands Gaming Board (NGB) and send you the contact of the bank. Upon your comfirmation of the type of account, our lawyer will notify the Netherlands Gaming Board (NGB), so as to give approval to our paying bank, the permission to make the transfer. You should send us your personal contact phone number so the bank can contact you by phone and email as soon as you make a choice of account you wish to activate. Note that your quick anticipation, will determine how soonest you will get your money. We wait to hear from you soonest and again we say congratulations once more. A Daily Account will be fine for me. We are in receipt of your mail.Your information has been forwarded to our paying banks which will advice you on how your account will be activated. Remember to notify us when you receive your winning in your account so that we can have your winning certificate sent to you. We will wait to hear from you soon. Subject: Miss Young, BANK DEPOSIT IN YOUR FAVOUR! This is to inform you that we have received a payment advice for the sum of One Million Five Hundred Thousand United States Dollars (US$1, 500, 000, 00) from Lottery Payment Office, Via Foreign payment service to be credited to your designated account. Since you do not have an account with this bank, your funds have been lodged in a suspense account pending your activation of an account with us. Please fill out the attached offshore account opening forms and return by fax immediately with a copy of your valid identification document (International Passport or Drivers License). Upon the receipt of your account opening form we will give you directives on how you will make the transfer of your initial deposit to us for your account to be activated. Please notify us also if you wish to make transfers to other accounts. Please note the type of account we have in our bank, initial deposit and the maximum transfer possible in one month. 1. Regular Account: The initial deposit is ?1,500 .00 (One Thousand Five Hundred Euros) and the maximum transfer possible in one month is Five Hundred Thousand United States Dollars. 2. Daily Account: The initial deposit is ?2,500 .00 (Two Thousand Five Hundred Euros) and the maximum transfer possible in one month is One Million United States Dollars. 3. Premium Account: The initial deposit is ?3,500 .00 (Three Thousand Five Hundred Euros) and the maximum transfer possible in one month is One Million Five Hundred Thousand United States Dollars. 4. Platinum Account: The initial deposit is ?4,500 .00 (Four Thousand Five Hundred Euros) and the maximum transfer possible in one month is Five Million United States Dollars. Note that the sum I won suddenly increased from $850k to $1,5m. Subject: Miss Young, INITIAL DEPOSIT INFORMATION! After the payment has been made, you will be required to notify us and send to us the payment information as listed below. Please fill out the attached offshore account opening forms and return by email attachment or by fax immediately. Upon the receipt of your completed form and initial deposit via email and telephone, your account will be activated within 2 hours and you will be required to furnish us of an account co-ordinate where you wish to receive your winning outside Netherlands and the transfer will be made within 24-48 hours with a confirmation to be sent to you. We hope you will understand this and thank you for banking with us. On the website of the real lottery, http://www.bankgiroloterij.nl, you can see that all this is a scam. Therefore I decide to stop here. 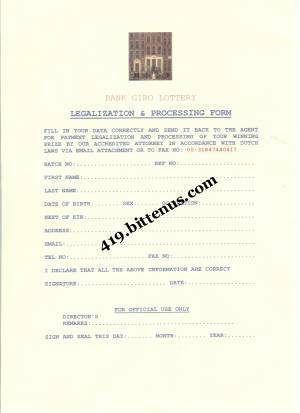 Warning fake e-mails BankGiro Lottery We are sorry to inform you the message you have received from the BankGiro Lottery telling you�ve won a prize, is a hoax. It appears a number of English speaking people have received similar messages. Currently we are trying very hard to find out who is responsible for this. We would like to point out that any prizes you win in our lottery will automatically be transferred to your bank account. Any message you might receive telling you to take any action in order to obtain a prize is surely fake. Also, the contact information (address, people allegedly working for the BankGiro Lottery) mentioned in the message are all fake. Any further messages from this sender should be considered as junk mail and can be deleted instantly. Your can read more about other (fake) lotteries on my homepage.